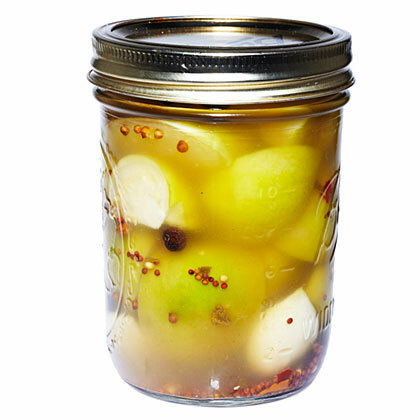 Pickled tomatillos are fantastic in a Bloody Mary or with charcuterie. Heat vinegar, sugar, salt, and 3 cups water in a medium saucepan until simmering. Put 2 garlic cloves, heaping 1/4 tsp. mustard seeds, and 1 tsp. pickling spice into each of 3 widemouthed pt. jars. Fill jars with tomatillos, pushing down to pack. Pour hot brine over tomatillos to fill each jar to the top. Seal with lids. Chill to develop flavor, at least 4 days and up to 1 month.